It's the end of the month, so it's time to finish up our minimum at the country club. Naturally, we asked Brother Monkey and Torry to join us for this endeavor. We were having so much fun that I forgot to capture our appetizers (wild mussels and risotto, lobster ceviche, and Korean barbecued beef lettuce wraps), soups (New England clam chowder), and salads (baby greens and bocconcini). 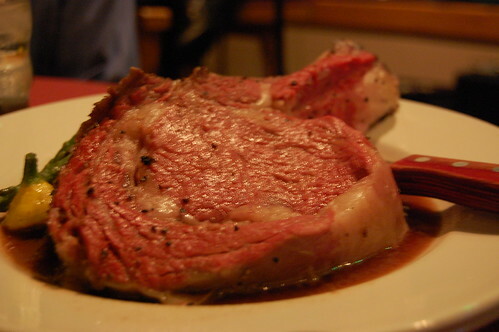 When BroMo's Flintsone-sized prime rib came out, Mr. Monkey said, "Hey, aren't you going to take pictures?" Yes. Yes, I am. 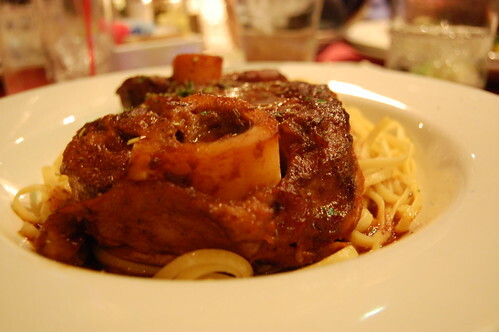 The giganto prime rib. Blurry but still impressive. 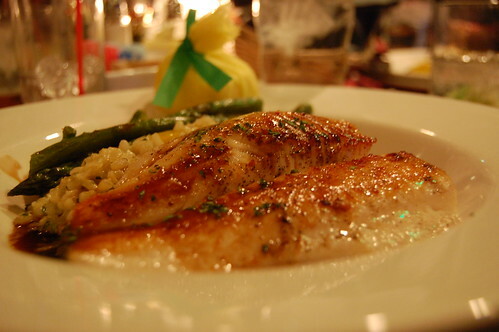 Mr. Monkey's broiled black cod. Everything was pretty good, but I think I was the big winner for the night with my dish. It was fall-off-the-bone-tender. 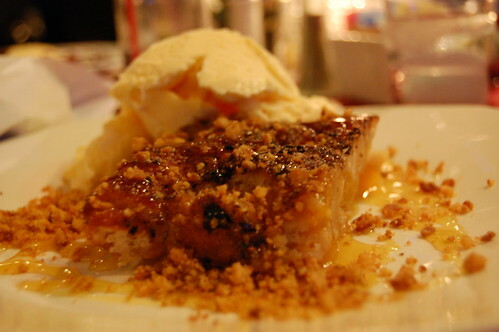 Of course, dinner wouldn't be complete without a sweet treat. Or three. This brownie sundae concoction is named after the daughter of someone important at the club. It is Torry's usual dessert choice. 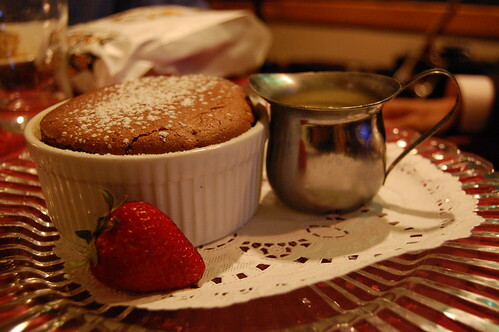 And the best -- fresh-baked hot chocolate souffle with creme anglaise. Fantastic. Such a great way to use up my rare chocolate intake. Torry reads my blog, so she knows just how funny it is that BroMo never smiles for the blog. It's such a long-running schtick that more recent readers actually believe BroMo doesn't smile, period. In fact, someone once commented, "Why doesn't Brother Monkey smile? Why is he so angry all the time?" In reality, he smiles frequently. 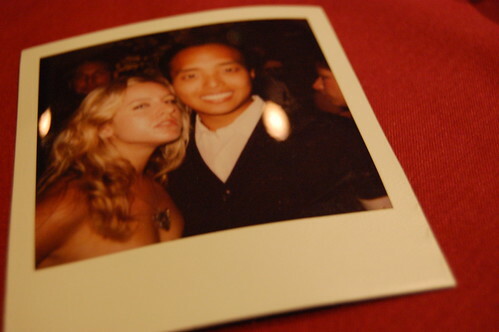 Torry brought a recent Polaroid just for my blog. We thought it was hysterical because it is the complete opposite of what always appears here. Torry isn't smiling! Holy mother of god! I'm sitting here looking at that prime rib drooling. Your bro has a great smile and I like the way Torry looks all, "what's up? don't mess with my man!" 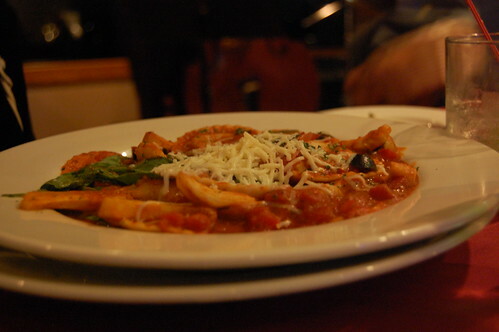 As always, your posts make me hungry! I cheated and looked at the pics first and had the same reaction! I love that Bro Mo is smiling and Torry isn't. Bro Mo and Torry are such cuties! torry looks cute even when snarling. BroMo really does have a great smile. "Flintstone-sized" is a very apt description! I love the role reversal pic of Bro Mo and Torry. Haha! I read the other one first. Is BroMo changing his non-smiling ways now? It's weirder to see a picture of Torry not smiling than a picture of BroMo smiling. ditto, jane - bromo does have a great smile! good to see he has used it in the past. that food looks SOOOO good. also want to eat torry and bromo's faces. that chocolate souffle looks delish. broMo has such a cute smile :-). Torry is always adorable, even when she is not smiling. Are you the youngest people at your cc? 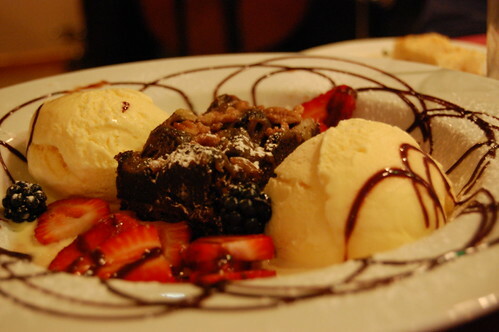 And that brownie sundae looks spectacular. i'm surprised that BroMo allowed that photograph to be blogged. as always, torry is adorable. bro mo is so cute when he smiles!! That picture is great. BroMo's whole face lights up when he smiles. Love it!